Let every instrument be tuned for praise! Let all rejoice who have a voice to raise! And may God give us faith to sing always: Alleluia! Western Boulevard Presbyterian Church encourages its members to share and develop their musical talents. There are many ways to get involved. Please feel free to email Janet Cherry, Director of Music and Organist, or Van Anthony Hall. On Sunday, May 19 at 3:00 p.m., The Raleigh Camerata will present a concert featuring fortepiano specialist Randall Love, performing on an original 1805 square piano. The square piano was the instrument for the everyday home, the place where most music making happened. Come hear classical chamber works with the keyboard instrument with which it was most commonly performed. Ticket prices at the door for adults are $20, $15 for seniors, $5 for students, free for ages 12 and under. 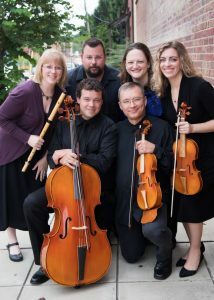 The Raleigh Camerata, a group of period musicians located in central North Carolina, is dedicated to the performance of small to midsize chamber music of the Renaissance through early Classical periods. Their instruments (strings, woodwinds and harpsichord) are copies of those used in the 16th, 17th, and 18th centuries. Led by artistic director Dr. Kelly Nivison, the Raleigh Camerata strives to bring early music to life for audiences in the Raleigh-Durham area through creative concert programming. Our Chancel Choir (for adults and teens) sings for 10:30 a.m. Sunday worship and seasonal services. We sing a wide range of music – church anthems and hymns from the Renaissance to the present day, chant, spirituals, Taize, folk music from America and around the world, and contemporary styles. The Chancel Ringers (for adults and teens) play for Sunday worship monthly and for special seasonal services. In addition to music for handbells alone, they accompany congregational hymns and responses, and choir anthems. WBPC owns a 4 1/2-octave set of Schulmerich handbells and a 3-octave set of Malmark Choirchimes. Singers are welcome to share their talents in variety of formats, including solos, duets, trios, and other small ensembles. The Praise Team leads worship at the contemporary (@TheTable) service on Sunday evenings at 5:00 pm. Van Anthony Hall directs this team. 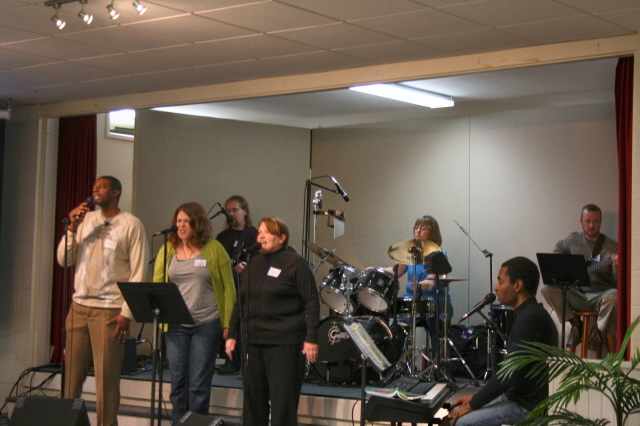 The team includes Bruce, Katie, and Beth, vocalists; Van Anthony, keyboard, and Jeff, guitar, and Heidi, drums. Children learn to praise God with many new and exciting songs during VBS week. Volunteers at WBPC lead our children ages 3 through Second grade in music during Sunday School times. WBPC is fortunate to have many instrumentalists in their midst. 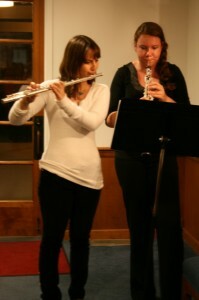 Members play piano, guitar, flute, clarinet, oboe, bassoon, and percussion. Opportunities are always available to collaborate with the choirs, to play solo, or to participate in an ensemble. In 2006, through the generosity of church members and the Shalom School of the Arts, WBPC purchased its first Orff instruments. At left Morgan playing flute and Miranda playing oboe.